OnePlus 2 vs Asus Zenfone 2 Comparison - What's Different? OnePlus launched its most powerful flagship phone OnePlus 2 today. It comes with 5.5-inch Full HD display, 4 GB of RAM and more great features. The first 4 GB RAM phone was launched by Asus company in their Zenfone 2 model. 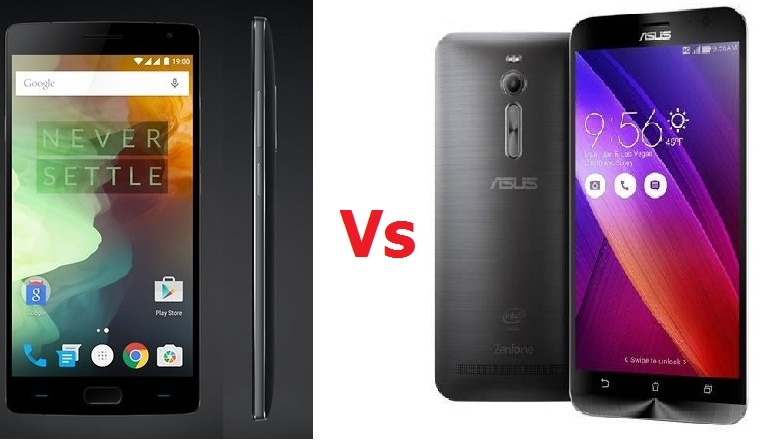 So here is the comparison for most powerful smartphones between OnePlus 2 and Asus Zenfone 2. Both are having almost same specifications but OnePlus 2 have the extra features of FingerPrint sensor and USB type-C connectivity. Also it has better Camera and Battery than Zenfone 2. OnePlus 2 is slightly weigher than Zenfone and No support of External memory card is the cons of the phone.